Akua’s innovative line of modifiers allows artists to cater Akua Inks’ viscosity and transparency to ideally-suit their printmaking project. Each of the seven modifiers listed below carries the AP Seal. Available in both 8oz. and 16oz. sizes, Akua Transparent Base can be used with either Akua Intaglio® or Liquid Pigment® Inks. When used with Akua Intaglio, Akua Transparent Base will increase the ink’s transparency. When used with Akua Liquid Pigment, Akua Transparent Base will thicken the ink and create a new Akua Intaglio color. 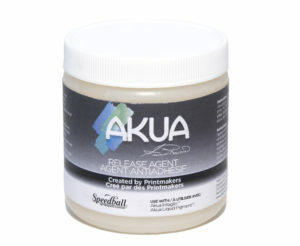 Akua Release Agent is used for monotype ghost prints, to create high shine in Akua Intaglio metallic colors, or when doing monotype prints with Akua Liquid Pigment. Akua Release Agent acts to soften the pigments on the printmaking plate, enhancing their vibrancy and appearance after printing. Akua Blending Medium is used to thin either Akua Intaglio or Liquid Pigment Inks for brushwork, to create wash effects, or to use as a resist for viscosity monotype printing. 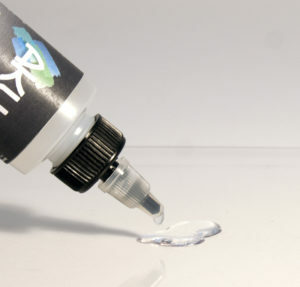 For use with Akua Intaglio only, Akua Mag Mix is used to add depth and stiffen the ink. 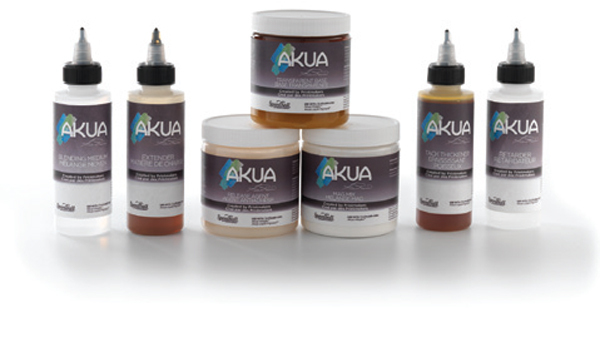 Akua Extender is used to thin or reconstitute Akua Liquid Pigment if it becomes too thick. Akua Extender is not suitable for use with Akua Intaglio Inks. 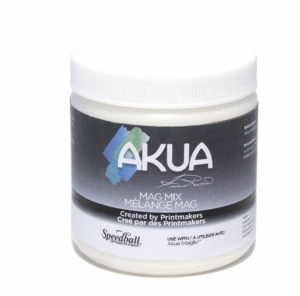 Akua Retarder is used to further slow the drying rate of Akua Liquid Pigment and acts as a release. Ideal for use when printing with Akua Liquid Pigment in very hot, cold or dry climates, or when printing on dry paper. Akua Retarder is not suitable for use with Akua Intaglio. Akua Tack Thickener is used to thicken Akua Liquid Pigment Inks for heavier rollup applications for monotype or block printing. Akua Tack Thickener is not for use with Akua Intaglio Inks. Want to learn more about which Akua Modifiers are the best fit for your studio? Watch the Akua Tips & Tricks video or download the Akua User Guide to get great details on how to incorporate these amazing products into your processes!